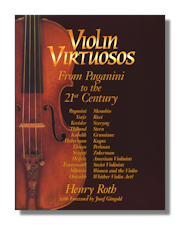 Violin Virtuosos: From Paganini to the 21st Century. Henry Roth. University of California Press. 1997. ISBN 1879395150 (paperback). Biographical Dictionary of Violinists. Jean Marion Haig-Whiteley. Self. September 1999. ISBN - Available from the Author - (hardcover). After 15 years research and preparation now published initially on the Web. Contains 900+ biographical entries. Short history of violin playing, origins and ancestry, list of key figures and influences, chart, and bibliography. Composers in America: Biographical Sketches of Contemporary Composers With a Record of Their Works. Claire Raphael Reis. Da Capo Press. 1977. ISBN 0306708930 (hardcover). A Handbook of American Music and Musicians. F. O. Jones. Da Capo Press. 1971. ISBN 0306701634 (hardcover). Containing biographies of American musicians and histories of the principal musical institutions, firms, and universities. Biographies of Celebrated Players and Composers. Philip Bone. Reprint Services Corp. 1988. ISBN 0317907670 (hardcover). Guitar and Mandolin players and composers. Minimalists. K. Robert Schwartz. Phaidon Press. 1996. ISBN 0714833819 (paperback). A Polish Renaissance. Bernard Jacobson. Phaidon Press. 1996. ISBN 0714832510 (paperback). Russian Composers and Musicians: A Biographical Dictionary. Alexandria Vocarsky-Shiraeff. Da Capo Press. 1969. ISBN 0306713217 (hardcover). Composers of the Low Countries. Willem Elders, Graham Dixon (Translator). Oxford University Press. 1991. ISBN 0198161476 (hardcover). A Dictionary of Early Music: From the Troubadours to Monteverdi. Jerome Roche, Elizabeth Roche. Oxford University Press. 1981. ISBN 0195202554 (hardcover). Greene's Biographical Encyclopedia of Composers. David Mason Greene. Anchor (formerly Doubleday). 1985. ISBN 0385142781 (paperback). One Hundred and One Masterpieces of Music and Their Composers. Martin Bookspan. Anchor (formerly Doubleday). 1973. ISBN 0385057210 (paperback). The New Grove High Renaissance Masters. Gustave Reese (Editor). W.W. Norton & Company. 1984. ISBN 0393016897 (paperback). Comprehensive biographical articles taken from the New Grove Dictionary of Music & Musicians. Included are: Josquin, Palestrina, Lassus, Byrd, Victoria. The New Grove French Baroque Masters. James R. Anthony, H. Wiley Hitchcock, Edward Higginbottom, Graham Sadler. W.W. Norton & Company. 1997. ISBN 039330356X (paperback). Comprehensive biographical articles taken from the New Grove Dictionary of Music & Musicians. Included are: Jean-Baptiste Lully, Marc-Antoine Charpentier, Michel De Lalande, François Couperin, Jean-Philippe Rameau. The New Grove North European Baroque Masters. Joshua Rifkin, Colin Timms, George Buelow, Kerala Snyder, Jack Westrup, Martin Ruhnke. W.W. Norton & Company. 1998. ISBN 0393315940 (paperback). Comprehensive biographical articles taken from the New Grove Dictionary of Music & Musicians. Included are: Heinrich Schütz, Johann Jacob Froberger, Dietrich Buxtehude, Henry Purcell, and Georg Philipp Telemann. The New Grove Masters of Italian Opera. Philip Gossett, William Ashbrook, Julain Budden, Friedrich Lippmann, Stanley Sadie. W.W. Norton & Company. 1997. ISBN 0393303616 (paperback). Comprehensive biographical articles taken from the New Grove Dictionary of Music & Musicians. Included are: Gioachino Rossini, Gaetano Donizetti, Vincenzo Bellini, Giuseppe Verdi, Giacomo Puccini. The New Grove Russian Masters, II. Gerald Abraham, Geoffrey Norris, Hugh Macdonald, Rita McAllister, Boris Schwarz. W.W. Norton & Company. 1986. ISBN 0393022838 (paperback). Comprehensive biographical articles taken from the New Grove Dictionary of Music & Musicians. Included are: Nikolai Rimsky-Korsakov, Alexander Skryabin, Sergei Rachmaninoff, Serge Prokofieff, Dmitri Shostakovich. The New Grove Twentieth-Century American Masters. John Kirkpatrick, Andrea Olmstead, Bruce Saylor. W.W. Norton & Company. 1997. ISBN 0393315886 (paperback). Comprehensive biographical articles taken from the New Grove Dictionary of Music & Musicians. Included are: Charles Ives, Virgil Thomson, Roger Sessions, Henry Cowell, George Gershwin, Aaron Copland, Carter, Barber, John Cage, Leonard Bernstein. The New Grove Twentieth-Century English Masters. D. McVeagh (Editor), Diana McVeach, Anthony J. Payne. W.W. Norton & Company. 1986. ISBN 0393303519 (paperback). Comprehensive biographical articles taken from the New Grove Dictionary of Music & Musicians. Included are: Edward Elgar, Frederick Delius, Ralph Vaughan Williams, Gustav Holst, William Walton, Michael Tippett, and Benjamin Britten. The New Grove Twentieth-Century French Masters. Jean-Michel Nectoux, et al. W.W. Norton & Company. 1986. ISBN 0393303500 (paperback). Comprehensive biographical articles taken from the New Grove Dictionary of Music & Musicians. Included are: Gabriel Fauré, Claude Debussy, Erik Satie, Maurice Ravel, Francis Poulenc, Olivier Messiaen, Pierre Boulez.